Wintery weather in the county’s mountains means many San Diegans will be rushing east this weekend, trying to reach a bit of snow. But if you’re among the hoards planning to take the trek, know the California Highway Patrol is requiring all vehicles to have snow chains. The devices give traction on icy roads, help you stop more quickly and prevent you from spinning out and crashing. 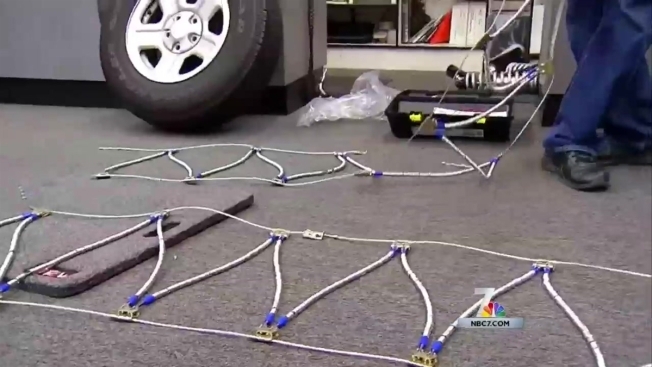 Wally Palmer with Off Road Warehouse gave some tips on putting on the chains, which are almost foreign objects to most in Southern California. If you have front-wheel drive, Palmer said, put the chains or cables on the front tires. If you have rear-wheel drive or four-wheel drive, put them on the back tires. On Thursday, CHP officers and volunteers manned posts along Sunrise Highway to make sure drivers reached Mount Laguna safely. At one point Thursday, the side of the highway was packed with drivers putting on their chains so they could get to deeper snow up the mountain. The first series of El Nino storms brought this week’s snowfall to the mountains. They caused downpours, flooding and damage closer to the coast.